Tawang Station is the biggest train station in Semarang, the capital city of Central Java. The station is the oldest major railway station in Indonesia after Semarang Gudang Station and opened in 19 July 1868 for track Semarang Tawang to Tanggung. Economic class train does not stop at this station, but stop at Semarang Poncol Station. The station has a unique, each train will come, Gambang Semarang song will be played, but only played with piano. However, because of the rapid development of the Semarang City and the improper city planning for the Semarang City as a coastal city, then Semarang Tawang station frequently gets flooded when hard rain comes or the sea level rises. Besides the heavy three-day rainfall in a row and high tide in Java Sea, the flood is brought about by the loss of catchment areas in the north of the station. Flood is the main problem that Tawang station has to cope with, not to mention a heap of waste in the eastern part of the station. These problems make the operation of the railway on the north route run unwell. Here's the our members favorite photos of "Railway Stations in Semarang". 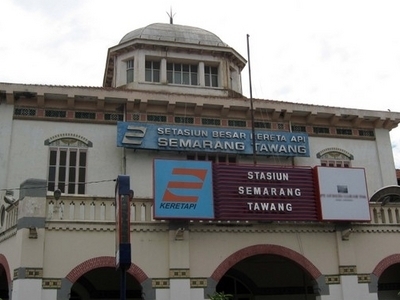 Upload your photo of Semarang Tawang Station! Connect with Andriani Wiria and Goutam Bagchi who have already visited Semarang Tawang Station.